Refrigerator. School lunch menus, AYSO soccer schedules, and possibly Webelos information would be affixed to this in coming years. Refrigerator magnets. 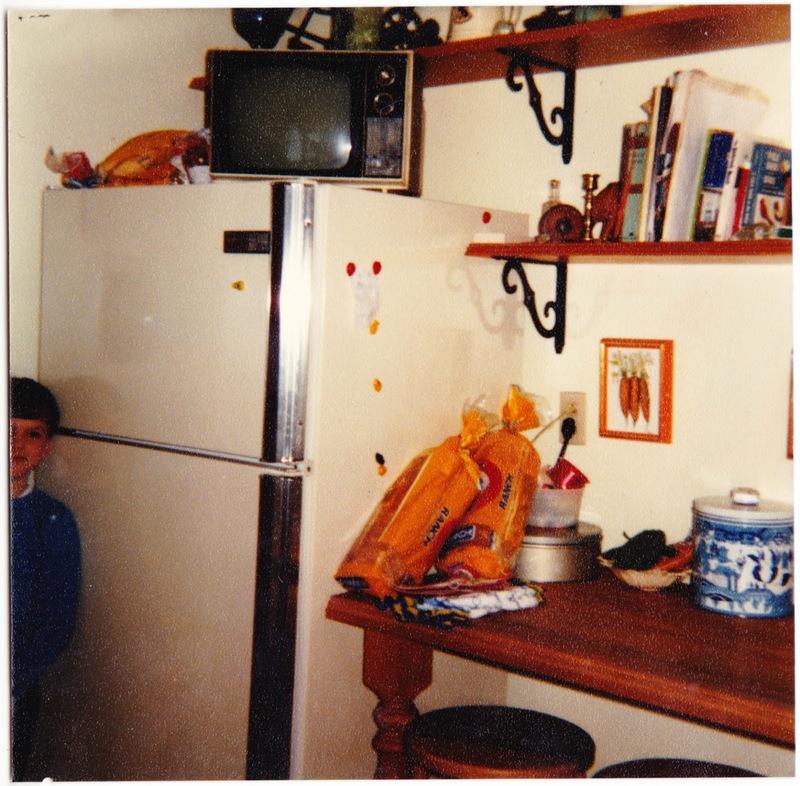 When Mom died, she left us with a gallon-bag full of refrigerator magnets accumulated over the decades. Many of them were from trips to other countries. Others were just cheap little ones that followed us through all the moves. I only kept a few. Antique apple corers. Mom had a big collection. I still have one, partly out of sentimentality and partly because they're cool. Chunks of Jersey glass. Mom dug these up in our yard at the previous house in Clayton, New Jersey, which was known for its glass factories back in the day. Two of those pieces of greenish slag glass are sitting on my desk as I type this. Television. Mom watched Good Morning America on weekdays and one of my clearest memories from this house is from December 9, 1980, when she first learned from GMA that John Lennon was dead. ... I believe this is also the TV that went on to become my Commodore Plus/4 computer monitor in the middle 1980s. I'm sure there's a photo around in one of these shoe boxes that can confirm that. Old medicine bottle. We like old bottles. Blue metal cookie container. I had this until recently, when I realized that its bulkiness outweighed its sentimentality. (Or maybe it's still in some corner of this house and I've forgotten about it.) There was a screw-in cap with little blue stones that you were supposed to heat in the oven every once in a while. Then you screwed it back into the lid and it would allegedly do a great job of keeping whatever was inside fresh. I have no idea about the science behind that. I have mixed memories from this kitchen. One of the first foods I learned to make on its stove was hot dogs. Most days after school, I'd come home through the house's side door directly into this kitchen, which is where I'd find Mom. ... I also had a minor disaster during fifth grade. On either Mom's birthday or Mother's Day, I tried to make her coffee as a "present" and ended up spilling boiling water on my left arm, necessitating a trip to the emergency room. I was a klutz and an ER Disaster as a kid, with other trips needed for a sliced-open forehead, a smashed cheek from walking into a swinging baseball bat (it's a whole dumb story) and a bee sting that made my whole body puff up with an allergic reaction. 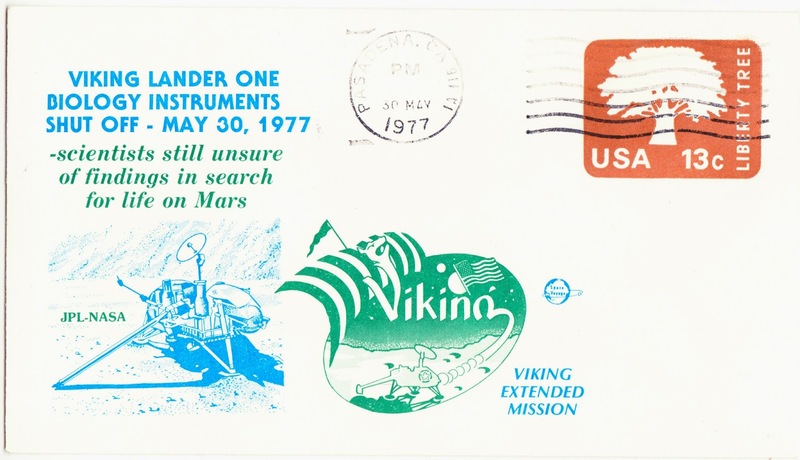 "Scientists still unsure of findings in search for life on Mars" states this oddly specific event cover for the "Viking Lander One Biology Instruments Shut Off" on May 30, 1977. With one exception outlined below, I found very little online regarding the specific timelines of the biology instrumentation for the Viking 1 space mission to Mars and Viking lander biological experiments. That exception was an awesome page on The Mars Society España website that's filled with fabulous event covers related to the space-exploration programs of the 1970s. You should check it out for the images and run it through Google Translate if you don't know Spanish. According to this page, the scientific-instrument experimentation of Viking Lander 1 (VL-1) indeed ceased operations on May 30, 1977. VL-2 had ceased operations two days earlier. The two historic landers continued to send weekly images and meteorological date through the early 1980s. Phys.org article from 2016: "Did 40-year-old Viking experiment discover life on Mars?" 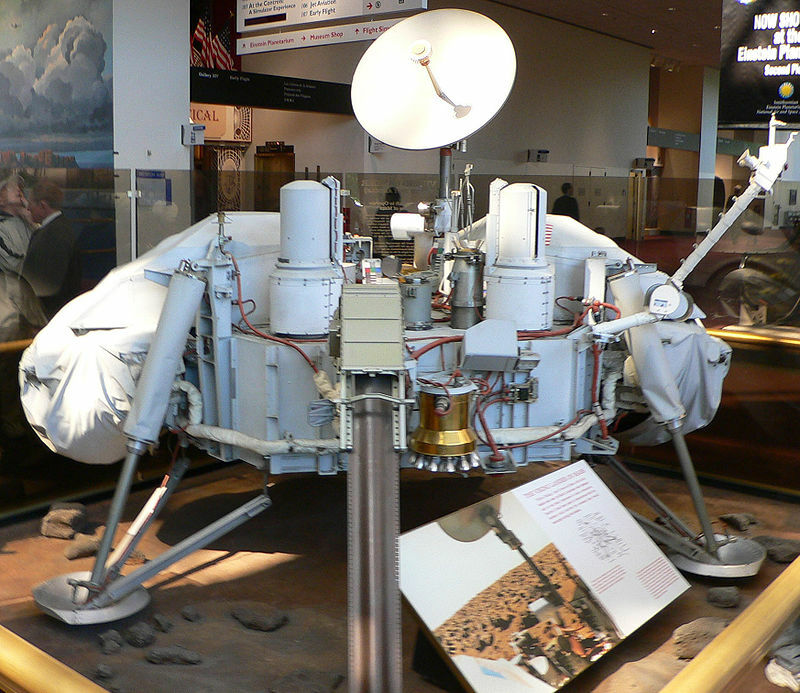 Model of Viking Lander at the National Air and Space Museum, Smithsonian Institute, Washington, D.C. 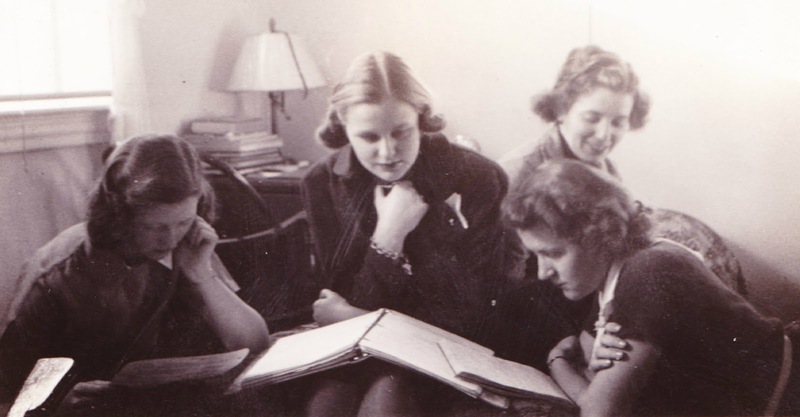 Here's my grandmother (lower right) reading and studying with classmates in her University of Delaware dormitory, circa 1937-1941. See more related photos here and here. Need some reading suggestions? Papergreat is back with more dandy links for you. Besides this, I'm still working my way through John Crowley's Little, Big (I needed to make a chart), among other books, and I've been catching up on the 2017 issues of G. Willow Wilson's Ms. Marvel. Vogue: "Mimi O’Donnell Reflects on the Loss of Philip Seymour Hoffman and the Devastation of Addiction"
This is long overdue. It's been nearly 100 days since the last full "From the readers" segment. So there are a lot of dandy contributions from all of you to present today. Let's get started! 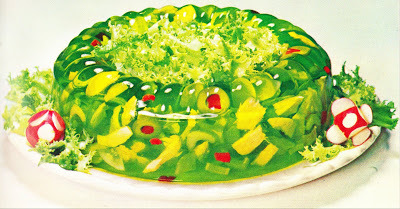 Halloween Countdown #3: Things you shouldn't put in Jell-O: Audrey Hutchison writes: "Actually if you use lime jello, sour cream, celery, green olives with pimento cut in half and tuna it's good. Don't use a mold, use a flat casserole dish so it can be plated with other salads or fruit." Mystery photo of riflewoman: Jim Fahringer writes: "I really like the idea of writing your own story to go with this picture. When I taught 4th Grade I would purchase all the old (mostly Victorian era) photographs I could find reasonably. We would then study the culture of the era. Each student would receive an antique picture and pretend that they were the person illustrated. They would make up a name and tell all about themselves including things like: why was this picture taken, what were you doing in this picture, what kind of things did you have to do to get ready for your portrait, what were your hobbies and pastimes, explanation of your hairstyle (How did you do it, how long did it take, etc. ), description of your clothing (was it comfortable or were things like starched collars and corsets really miserable to wear), family description, difficulties and trials (like disease, death, war, and other disasters), your occupation or chores, how you died, etc. These neat old photos are a wonderful tool that can stimulate creative writing in the classroom." Chris adds: Thanks for sharing this story, Jim! What a wonderful idea for using ephemera as a teaching aide. Witches, pickles and good fun at an 1893 party in Pittsburg, Kansas: Stealth Research Assistant and Executive Vice President in Charge of Ephemera Reunions "Mark Felt" writes: "For the second time I quote Fargo by the Coen brothers: 'I'm not sure I agree with you 100% on your police work.' This site gives the date of your article as March 16 (not 23), 1893 — or might the same blurb have been published twice, one week apart? 'But' (or even 'Bud') is not the first name of the individual in question, nor is 'Byrt' his last name. Rather, 'Byrt' is short for 'Albert', just as 'Bella' (Byrt's sister) is short for 'Isabella', and both shared the last name 'Maxwell' (before her marriage to Otto Greef) — see Find A Grave. Thus, Byrt and Bella (Albert and Isabella — elsewhere 'Isabelle') were brother and sister who hosted the 'Witch Party'. Byrt sold bicycles as of 1894. Byrt's wife Estelle also died young (at age 38 in 1910), as did his sister Bella (as you stated). Byrt and Estelle's son Donald fought in World War II, dying shortly thereafter. Donald's wife Thelma died in 1980 in Texas — and there the clues stop for that particular branch of the family tree. A collateral descendant, Stephen E. Greef, is a genealogist, and presumably knows how to fit the remaining pieces of the puzzle together." Chris adds: Thanks for the corrections and great legwork! This article definitely appeared The Pittsburg Daily Headlight twice, on both March 16 and March 23, 1893. The two pages on which the article appears are otherwise different, so it seems they just published it twice. Newspapers can make mistakes, it turns out. Though that doesn't make their content fake. Also with regard to this post, commenter "Kansas Kate" adds: "If you're on Facebook, check out the group Historic Pittsburg Kansas, where there's a c.1902 photo of the Greef house at 407 W Euclid." 1970's "The Halloween Hut" by Miriam Fuller: Joan writes: "Seeing books get discontinued is what triggers 'mild fear' in me. Of course, it's also how I got Nobody Plays With a Cabbage, so..."
Cheerful Card Company can help you earn extra money for the holidays: There are three more new comments from the post that has kept everyone buzzing over the years. Wendy Applegate writes: "I recently went through a box from my grandparents home and found 11 Salesman samples folders that have these cards in them. They look to be from the mid 50's. I love the suggestions on how to personalize your cards 'Mr. and Mrs. J. Bell and their little "Chimes"' is one of the suggestions. Love them! Not sure what to do with them, but so cool." 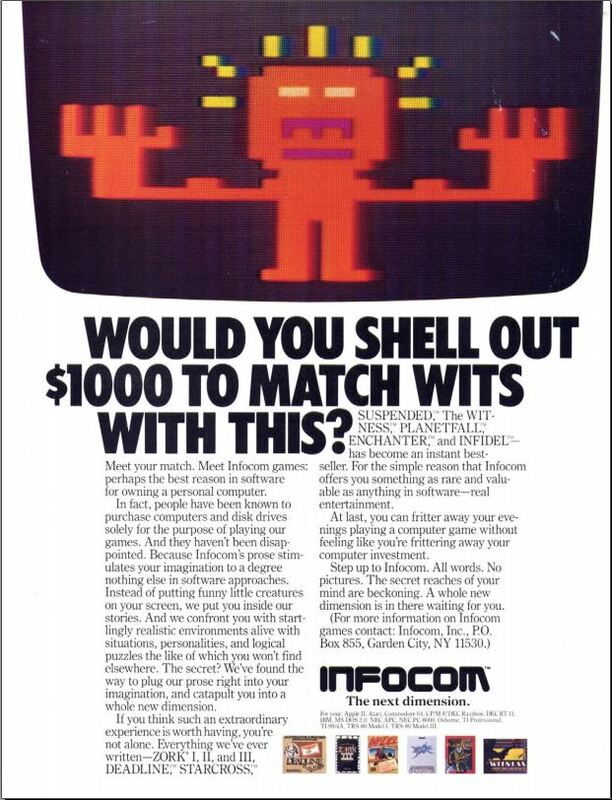 Anonymous writes: "I sent in the ad from the back of a comic when I was 8. I sold Cheerful Cards to all of my family, friends and neighbors. It was my first job, first money of my own and a strong lesson on meeting and dealing with different kinds of people, including some difficult cases. I would not take anything for the experience now and I am just retiring at 66! Wonderful, vivid delightful memories! You are simply uninformed if you think we were all 'suckers'!" 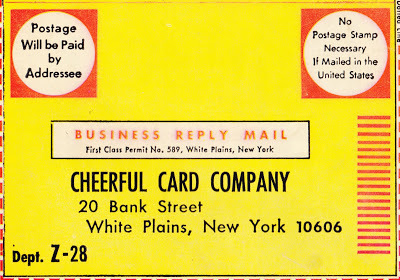 Zizzybob writes: "I worked for the Cheerful Card Company in White Plains NY in the summer of 1965. What a nightmare that was. It was like being in prison." Memory from the Gettysburg Times: Joan writes: "This is a wonderful story that I cannot believe I'd never heard before. Thanks for sharing it!" Fruitcake: Lost corners, rabbit holes and recipes: Mark Felt writes: "In Alex Cox's 1984 cult film Repo Man, Emilio Estevez discovers that his love interest (played by actress Olivia Barash) works at a mysterious venue named United Fruitcake Outlet. (The initials belie the venue's true intent.) Skip to minute 2:47 here. Chris adds: Fruitcake and UFOs. Perfect! Pete and Jeff's lending library: "Wow, that brings back memories. In third grade, my friend Nadine and I spent hours making index cards and card holders for all of her books. Same summer that we wrapped yarn around glass Pepsi bottles and thought we would make a killing. Where was Etsy when we needed it?" 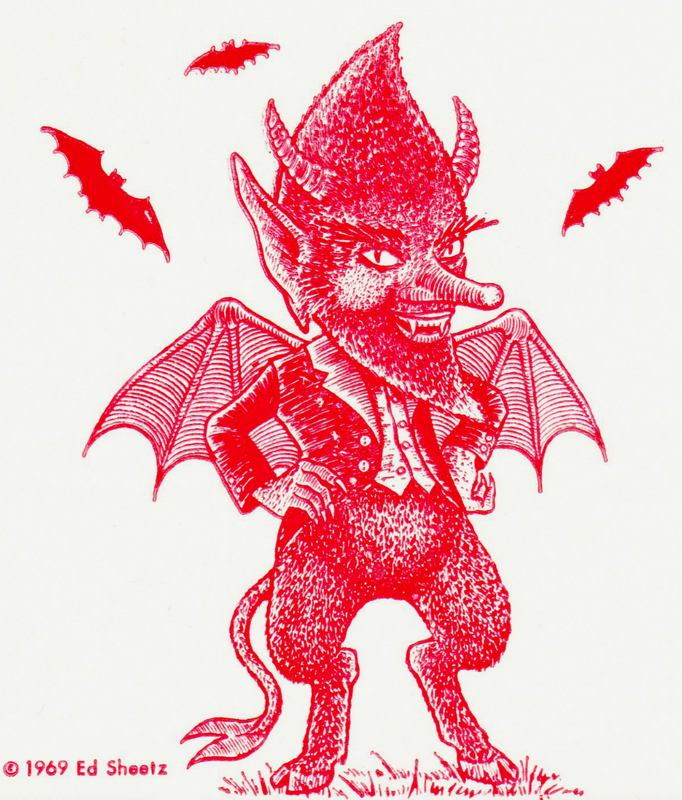 1969 Jersey Devil postcard illustrated by Ed Sheetz: "The Pine Barrens have lots of cool roads and historical places to explore. Load up the Scooby Mystery Machine. Of little, or no, consequence, 'puckish' is one of my favorite adjectives." Postcard: Graffiti-covered "student prison" in Heidelberg: "Great piece. I'm going to form a band ... and we will be called The Academic Miscreants. You can say you knew me 'when.'" Book cover: "The Dunwich Horror" (from Bart House Books): "I'm not sure if I love this cover or hate it ... which is not necessarily a bad thing." Old keno pamphlet from the Stardust casino in Las Vegas: "The Stardust still hasn't been topped in Las Vegas logo design (IMO)." 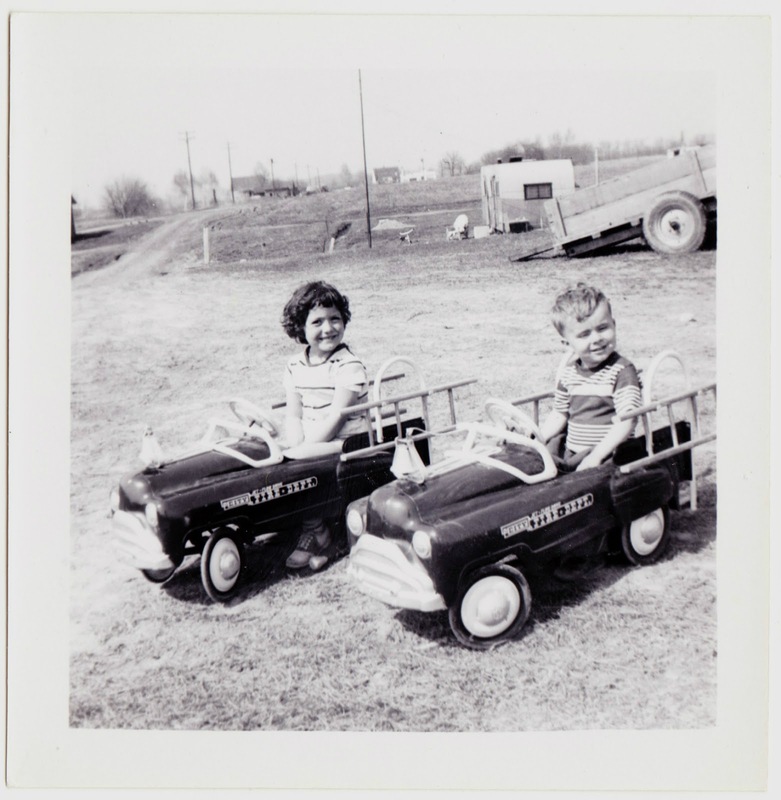 Vernacular photos: Fire trucks and the great outdoors: "Great found photos. I have an everlasting love for pedal cars." Florence Darlington: Without her, there would be no Papergreat: "Oooh, a mystery. Hope we find out more about her at some point." Spoiler #1: There is another post about Florence Darlington coming. Spoiler #2: It's going to be sad. Have a very Fritos Thanksgiving: "'More and more people are being captivated by the enticing taste of these new Mexican crisp chips, and are constantly finding manifold uses for their nourishing goodness.' ... I now feel my degree was a waste of time. I shall never be able to achieve such levels of cazzate elevate." P.S. from Chris: I should also note, with regard to this post, that readers Undine and Johnna Fick believe that the recipes for "Fritos Dressing" sounds "pretty good." 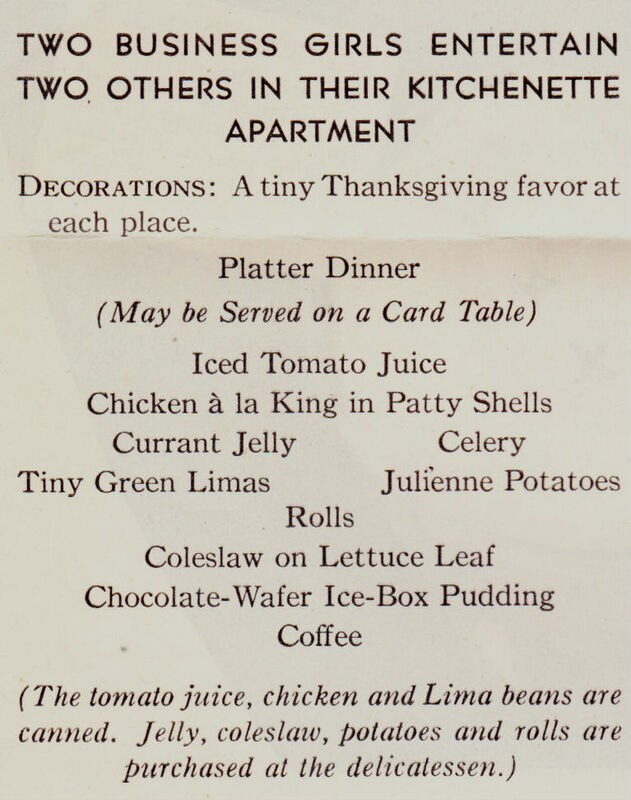 Bettina's Thanksgiving in the country (and more): "'Two Business Girls Entertain Two Others in Their Kitchenette Apartment' ... The most interesting 10 words that I've read today." Snapshot & memories: Me and Pop-Pop in the kitchen: "I love everything about this post. One set of my grandparents had Door #3 too. That noise ... and the sound of my Grandmother's giant creaky-doored gas range are the soundtrack to my childhood visits." Ink blotter for Cook, Watkins & Patch memorials: "Technacraft seems a very modern product description for a company that existed so long ago. 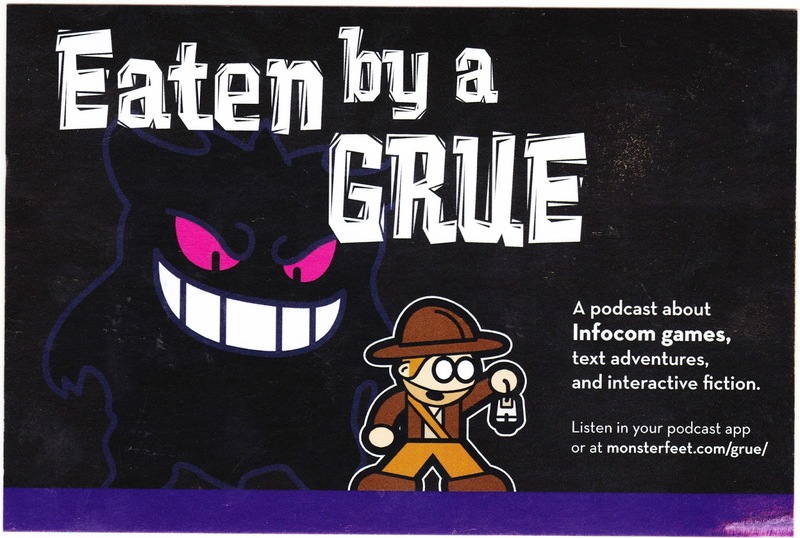 My marketing ancestors were slinging "jargon" even then." 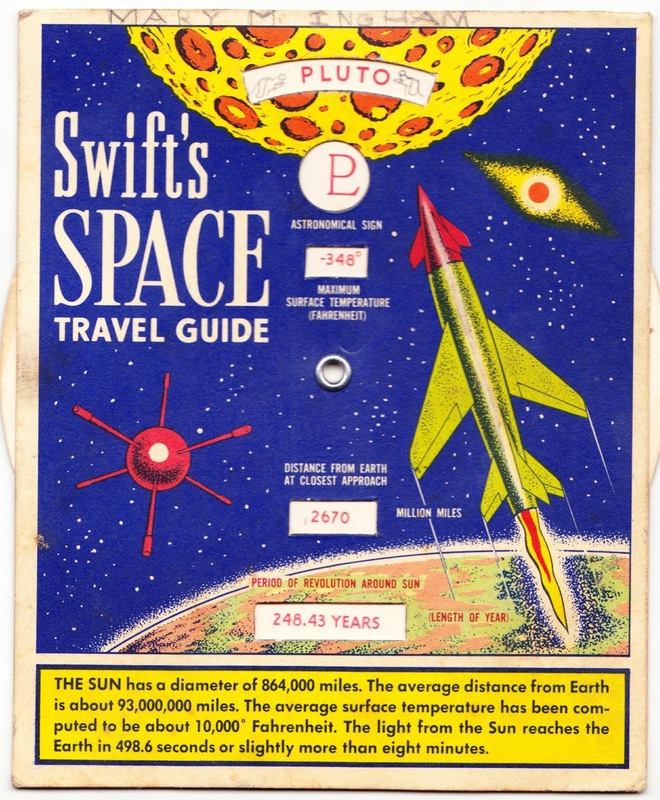 Learn about the Solar System with Swift's Space Travel Guide: "1. I tend to overuse the word fabulous; but this is FABULOUS. 2. I want to make Interplanetary Delight (unless it involves shredded coconut or anchovies). Heaven Forbid should it include both. 3. I want every single raygun on "Doc Atomic's Attic of Astounding Artifacts"
Some vintage board games you probably won't get for Christmas: "I don't think we ever played it; but I think I have a copy of Bermuda Triangle that was in a box lot at an auction once." 1914 postcard: "Road to White Horse Ledge and Echo Lake": "Now I want to go the New Hampshire to find this ghostly gentle man and his carriage." 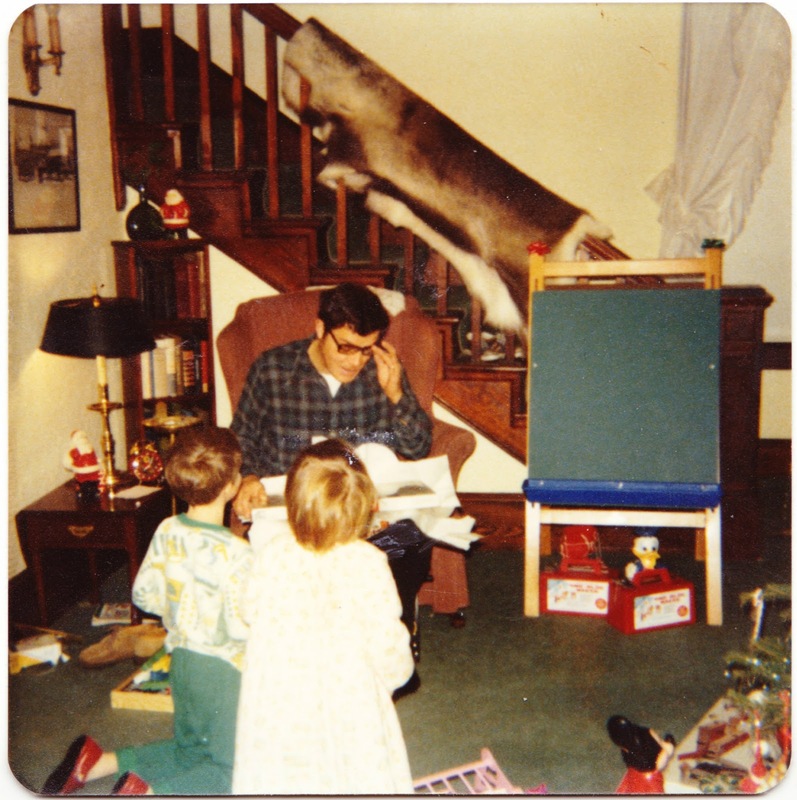 1970s Christmas snapshots of me: "Awwww, loved all these pics. We got snow block makers for Christmas too. 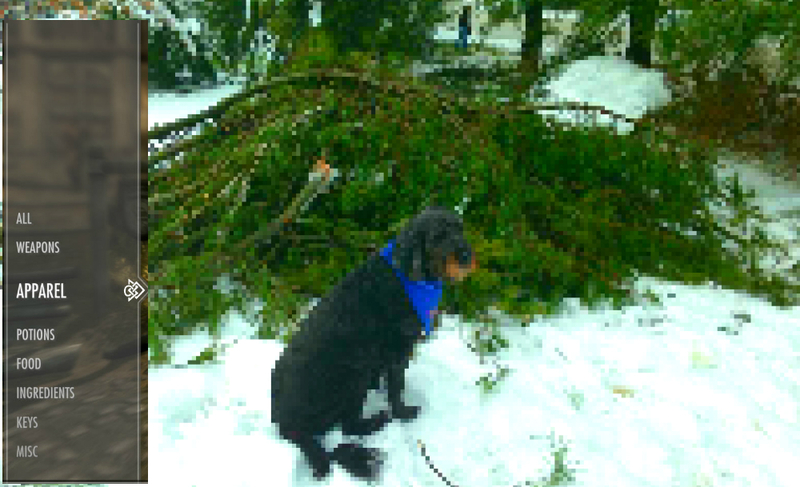 If I recall correctly, the year that we got them was particularly snowy so we used them a lot!" Science-fiction book cover: "Invaders from Rigel": "Best sentence that I've read all day: 'The white knight, he wrote in a fit of impish perversity, is climbing up the poker.'" Book cover: "Danny Dunn and the Anti-Gravity Paint": "Holy leaping creepers ... that's a cute cover." 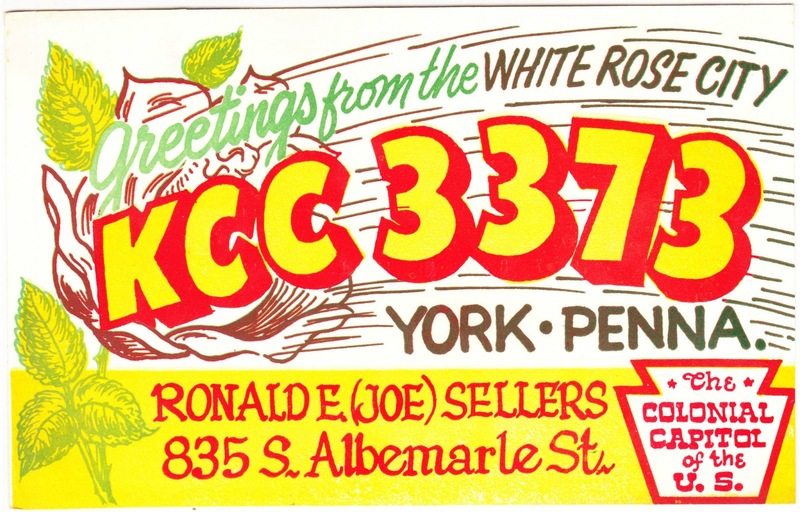 Colorful 1960s QSL card from the White Rose City: JJ writes: "When I came across this name [Ronald E. Sellers] in a [USS Blue Ridge] link it rang a bell, especially his academic studies of graduate computer science. I found his name in the '73 BR on-line cruise book in Operations as an officer, but because of the strange way they listed the scanned names on that page, I'm not sure of his mug. I didn't find him in either the '72 or '75 cruise books for BR and I have no other memories of that name. It is relevant to me because he may have been in that time period on BR that I got the Operation Buckshot assignment for helping EW to track those first Soviet satellites for radar tracking of our bird farms (US-A, US-P). I was told by my officers that they may have an officer aboard BR that could help me, but never heard any more about him or his name." 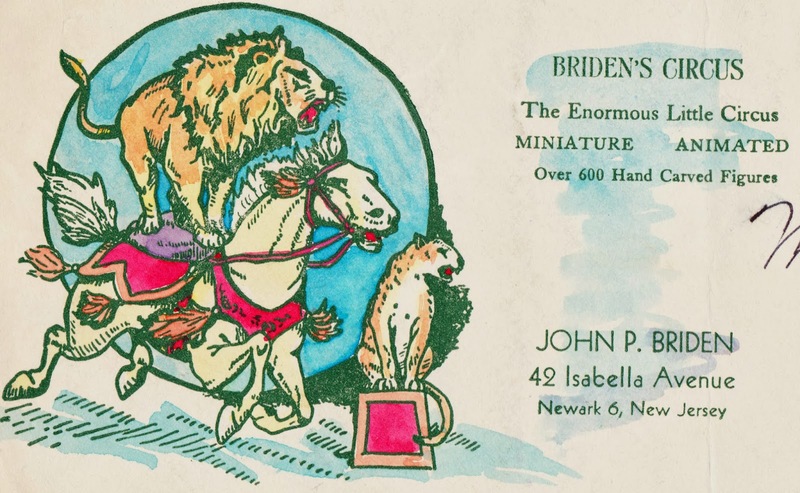 Mystery: John Briden's Circus in Newark, New Jersey: Herb Kingsland says that John Briden, Mini-Circus Ring Master, was a longtime next-door neighbor of his father's family in Newark, New Jersey. Kingsland shares some of his memories in this Facebook album. Edward Drosback's 1932 Christmas card to John Bryant: Regarding this 2012 post, a reader writes: "Ed Drosback was my grandfather. Where did you find this Christmas card?" Chris replies: That's a great question, after all these years. Most likely it came from a lower-end antiques store here in southcentral Pennsylvania. There's one in York New Salem that I frequent, and I know I've purchased Christmas items there. It might also have been purchased for me as a present, by someone who knows I love ephemera, in which case it still probably came from this general part of Pennsylvania. Sorry I can't be more specific after all this time. 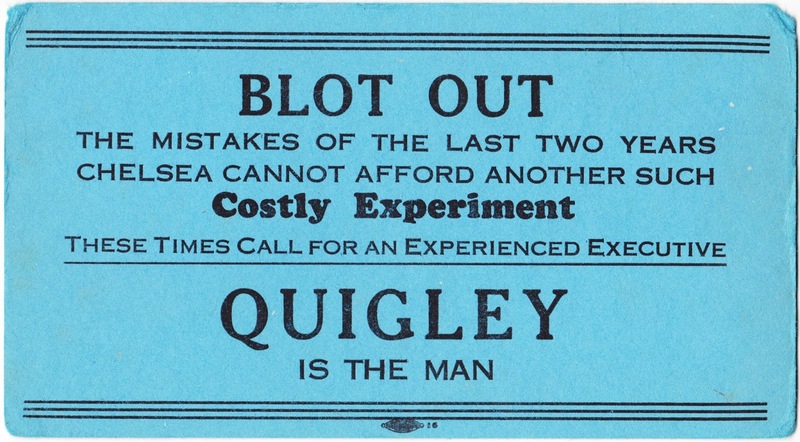 Vintage ink blotter supporting Quigley for mayor of Chelsea: Graham Quigley writes: "Hi there! Wonderful to read this. I am the youngest grandson to the late Mayor Lawrence F. Quigley. My father was Lawrence F. Quigley Jr. He passed away in 1983 when I was 8 years old. I never got a chance to meet my grandfather as he passed before I was born." Bookmobiles, #FridayReads and some recent articles worth reading: Tom from Garage Sale Finds writes: "The Bookmobile would come once a month to my elementary school. It was always exciting for me because I had access to books our school library didn't carry. There was no public library nearby. I don't remember when I stopped seeing the Bookmobile, but I would guess it was soon after our town finally got its own branch of the country library." A mysterious Daisie: Mark Felt writes: "The obscured initial before the letter 'A' on the calling card appears to be 'E.' A certain 'E.A. 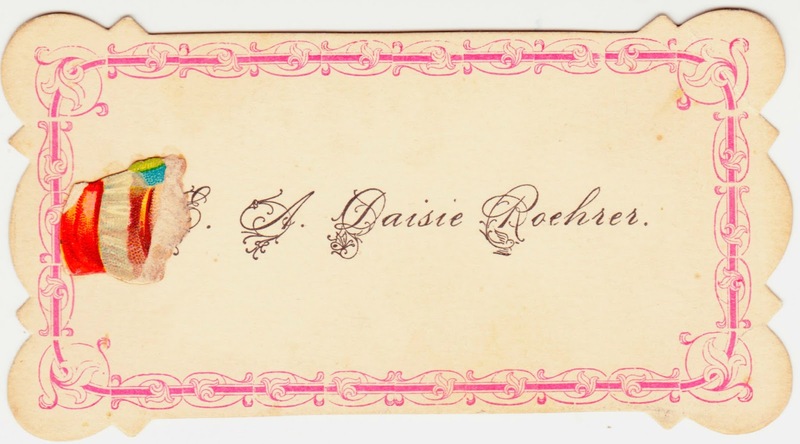 Daisy [sic] Roehrer' was a graduate of Ephrata High School in Lancaster County, Pennsylvania. According to this source, she graduated from that institution in 1895. That would place her year of birth in or around 1877, consistent with the year indicated on the gravestone you referenced above; however, the spelling of her first and last names remains inconsistent." One child is chosen to be "It": Joan writes: "I want to refuse to comment on account of the floating pun, but I will play along and say we played a LOT of Red Rover all the way up through high school." 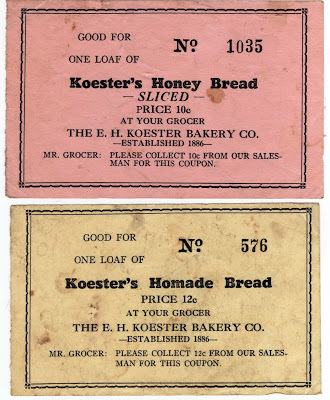 Coupons from the E.H. Koester Bakery Co.: Pop Pop writes: "We have a large, heavy metal tray with Koester logo. Love the weight of it." Book cover: "Cloe Spin and her Happy Family": Joan writes: "I think it's incredibly sexist that Cloe and her mother need to cover themselves but the men don't. Whatever." The Hams of Vesuvius, Virginia: Robert Hulvey writes: "Hi Chris. Well, it has been nearly 3 years. I had sent my mom a note about this, but she didn't respond, so I forgot about it. Anyway, she just sent it to me again so I came back to this site. I don't suppose you ran across the book again? I'm sure my mom could tell you a lot more about her father than I. They lived in Staunton, VA, along with his wife's mother (my great grandmother Garber, nee Curd). His mother, Rosa Ella whom you mentioned, lived right next door when I was a kid. He served in WW2, I believe in Iceland and in Germany. P.S. I am still thoroughly baffled as to why anyone would send an algebra book to an 'oyster and fruit' company, or why any company would sell both oysters and fruit. I think bartering was a more common thing back then, as my mom tells me that her father once traded a gun for a flute she still has, so maybe he traded the book for something. I'd also guess that AMH was probably his sister, Maxine, whose full maiden name was Audrey Maxine Ham. She passed away just a couple of years ago." The Lost Corners of Paul Crockett: Anonymous writes: "Actually Crockett didn't live near the family at Spahn. He came into contact with the family in the desert as he was a prospectors. He ended up becoming the manager of Brooks and Paul's band. Later he told Paul he could heal Paul of cancer if he abandoned his family and paid a lot of money, according to Paul. He also ended up leading his own cult which Brooks was part of, again according to Paul." Lost Corners: The Skyrim dog tale: Joan writes: "I KNOW THAT DOG. At first I thought the photo actually went with the tweets and I about lost my mind that there was a dog out there that looked JUST LIKE COBY. But then I figured it out. (It's 11:20 p.m. and I am not doing my best mental work at this time.)" My grandmother Helen Chandler Adams' dorm room at the University of Delaware, circa 1937-41. She had attended Wilmington (Delaware) Friends School in the mid 1930s. See more pictures of her college life in this 2011 post. 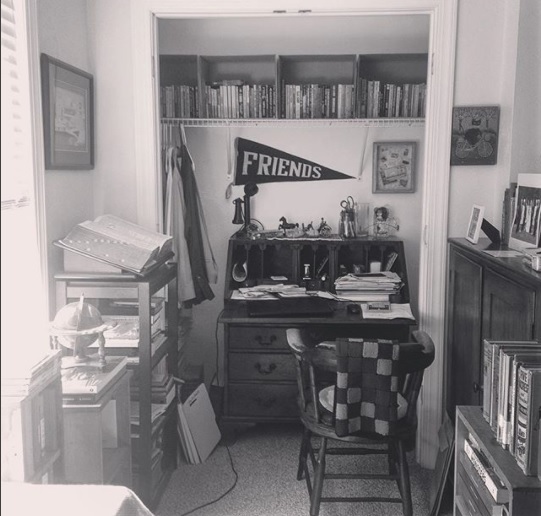 The work corner of my bedroom in Dover Township, York County, in the summer of 2017. 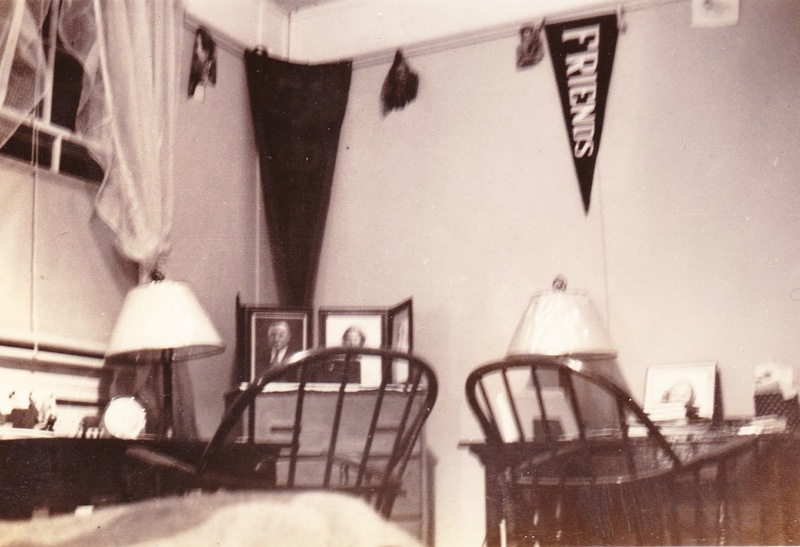 In the many decades in between these two photos, the Friends pennant had been affixed to the wall of the first-floor den at the house on Oak Crest Lane in Wallingford, Pennsylvania. 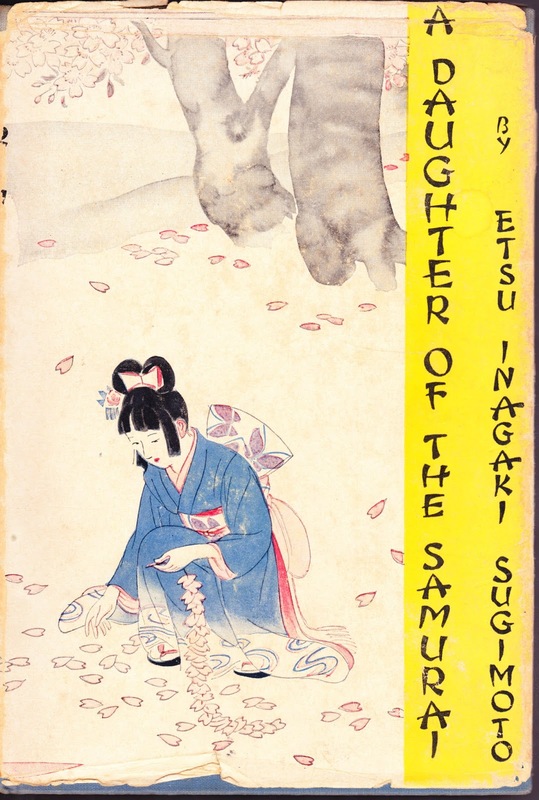 "A Daughter of the Samurai"
Subtitle (from title page): "How a daughter of feudal Japan, living hundreds of years in one generation, became a modern American"
Copyright-page acknowledgment: "Much of the material of this book originally appeared in ASIA but has been thoroughly revised for book publication." Dedication: "With respect and love and deepest gratitude I dedicate these sacred memories to MY TWO MOTHERS whose lives and environments were far apart, yet whose hearts met in mine." Author's acknowledgment: "To Nancy Virginia Austen, whose pleasant friendship and energetic spirit encouraged me to take up unfinished work which had been laid aside; and which, but for her, might have remained forever only bits of writing scattered far and wide — and a few silent memories." 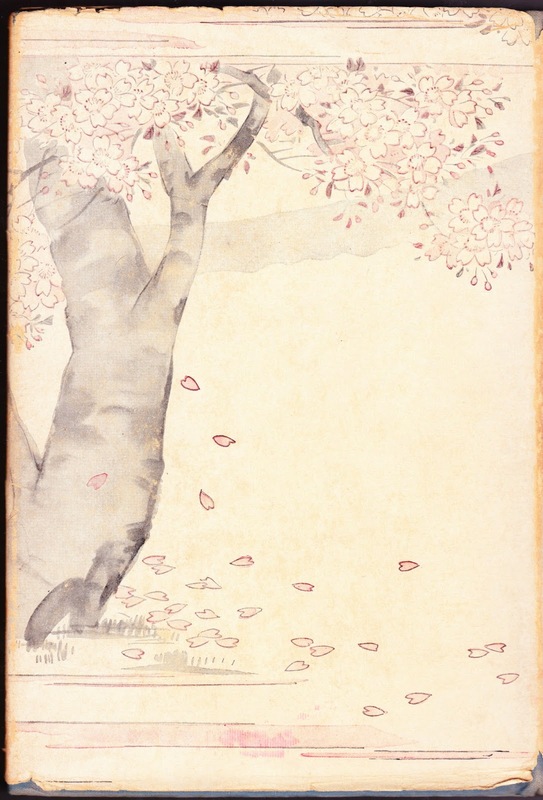 Excerpt from author's "To My Readers": "With deep appreciation I acknowledge the many beautiful letters which have come to me from the readers of 'A Daughter of the Samurai.' I am happy that so many are interested in the design on the cover for, because of tradition, this design speaks with silent eloquence to the heart of every Japanese. Our cherry blossoms never wither. they fall while still fresh and fragrant." First sentence: "Japan is often called by foreign people a land of sunshine and cherry blossoms." Last sentence: "The red barbarians and the children of the gods have not yet learned each other's hearts; to them the secret is still unknown, but the ships are sailing — sailing —"
Random sentence from middle: "One thing in America, to which I could not grow accustomed, was the joking attitude in regard to women and money." Goodreads rating: 4.04 stars out of 5.0. Amazon rating: 4.4 stars out of 5.0. Excerpt from Amazon review: In 2017, RJF in Illinois wrote: "This is one of the most beautiful books I have ever read. It is the story of (minor spoiler alert) the life of a woman raised in a samurai family in Japan, and the profound insights that she has from daily events as she travels to the United States and back to her homeland. It is stunning on two levels. First, the story continually reminded me of the plurality of perspectives in the world and the relative cultural barbarism of the West. Second, it is written in a style that I can only recall in one other book — The Last Fine Time by Verlyn Klinkenborg — that has a cadence that carried me like a gentle poem." Notes: Some background of Etsuko's life, from Wikipedia, helps to set the context for this autobiography: "She was born in Echigo Province in Japan. ... Her father had once been a high-ranking samurai official in Nagaoka, but with the breakdown of the feudal system shortly before her birth, the economic situation of her family took a turn for the worse. Although originally destined to be a priestess, she became engaged, through an arranged marriage, to a Japanese merchant living in Cincinnati, Ohio. Etsu attended a Methodist school in Tokyo in preparation for her life in the USA, and became a Christian. In 1898 she journeyed to the USA, where she married her fiancé and became mother of two daughters. After her husband's death she returned to Japan, but later went back to the United States to complete the education of her daughters there. Later she lived in New York City, where she turned to literature and taught Japanese language, culture and history at Columbia University." 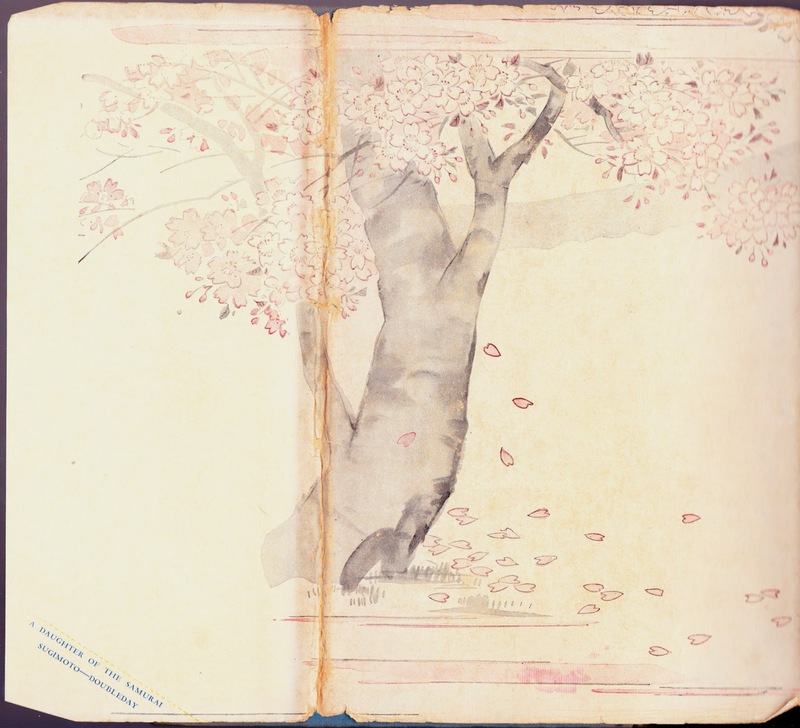 The illustration on the back cover of the dust jacket continues onto the inside back flap. Here's the full, unfolded view. 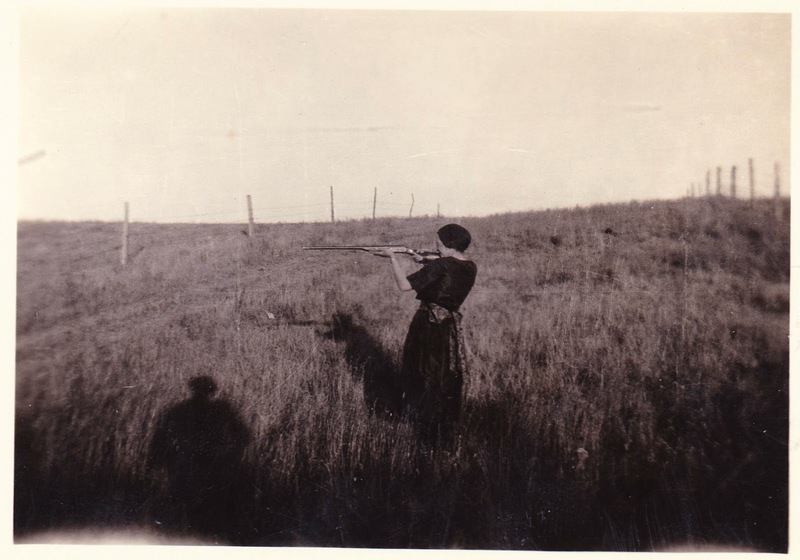 This small found photograph features a woman standing in a field and aiming a rifle. To the left, there is a shadow of another individual, who might or might not being the person snapping the photo. The width of the image is 3⅛ inches. 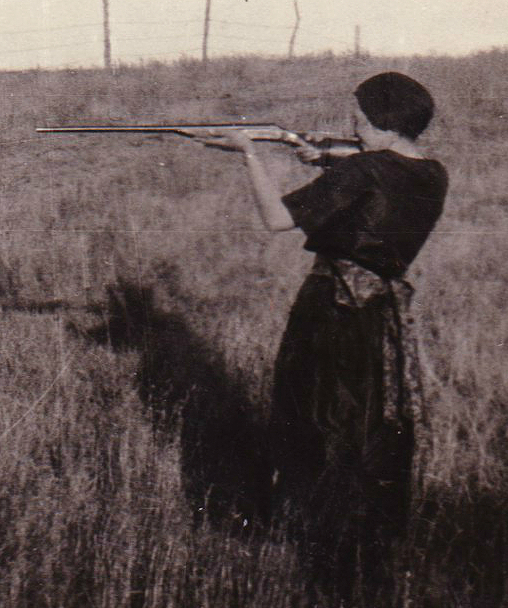 None of this, of course, gives us any insight regarding when and where this photograph was taken, who that woman is, or what she's aiming at. We can write our own story. I suppose some possibilities for her targets are cattle rustlers, traveling encyclopedia salesmen, aliens, gnus, and zombies. But we'll never know for sure. Is there enough detail for anyone to identify the rifle she's using? With regard to this dandy postcard, Wendyvee, who writes the awesome Roadside Wonders blog, served as my "ephemera procurement assistant." 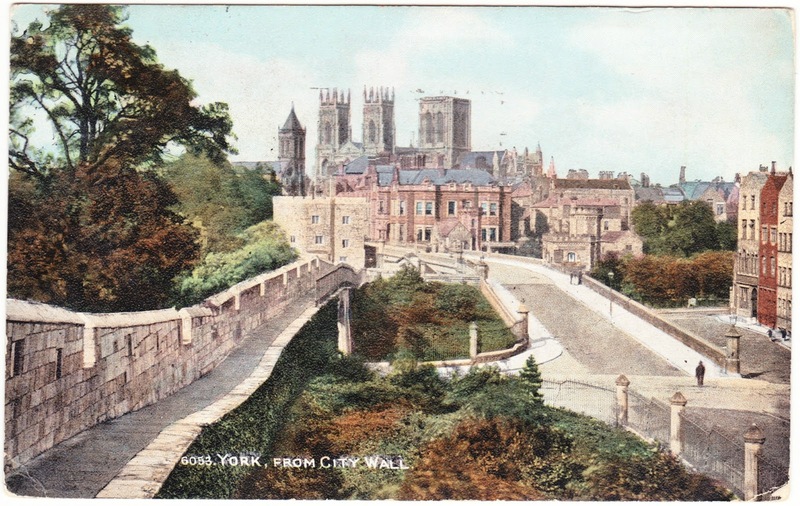 The 109-year-old card features York, England, viewed from a segment of its historic wall. York is, of course, the namesake for our city of York (the White Rose City) here in southcentral Pennsylvania. The one over there was founded in 71 AD and ours was founded in 1,670 years later, in 1741. We're just a toddler, by comparison. York, England, which was founded by Romans as Eboracum (glad that name didn't stick), currently has more miles of intact walls — about 2.1 miles (3.4 kilometers), according to the Visit York website — than any other city in England. Folks can even become a Friend of the Walls and sponsor specific stones in order to help protect and preserve them. The names of some key areas of the walls and gatehouses (called "bars") include Multangular Tower, Bootham Bar, Monk Bar, Walmgate Bar, Micklegate Bar (once the site of Sir Harry Hotspur's severed head on a pike), Fishergate Bar, Victoria Bar, Layerthorpe Bridge, Davy Tower, and Skeldergate. I have come to see the Pageant to-day. Hope you are better. We have had a cold wet summer. Love, [?]" One of the 15 or so COLDEST summers using the CET record (13.9degC / anomaly on 'all-series' of -1.4C) across England & Wales [in a record back to 1659]. > June was the equal (with 1916 and 1972) COLDEST of the 20th century, with CET=11.8degC, anomaly around two-degrees C below the LTA (whichever series is used), and the second-COLDEST (with the other two noted) June in the entire series. A day MAXIMUM TEMPERATURE of just 10degC (presumably this was registered as 50degF) was recorded in Oxford and Bath on the 6th. There was more outstandingly COLD, WET (some significant THUNDERSTORMS) & DULL weather from the 10th to the 12th, and also 20th to 28th. The Trooping the Colour in London was abandoned on the 24th. June was also a very DULL month, with no sunshine at all in London from the 2nd to the 6th.